clothes and dolls with her mother as a child. school to earn a little extra money. in until the last day of the deadline. deep breath and swim underwater. 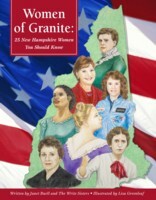 remarkable women from New Hampshire. friendly. The layout is exactly what a child needs. point of view it is superb." read about her, and the same goes for Granny D. . . .
women . . . worthwhile and presented nicely . . . "